Driving at night carries the highest fatality rate for drivers and pedestrians but could be made safer by headlight technology already on the roads in Europe and Canada. New research from AAA, done in partnership with the Automobile Club of Southern California’s Automotive Research Center, found that European vehicles equipped with adaptive driving beam headlights (ADB) increase roadway lighting by as much as 86 percent when compared to U.S. low beam headlights. AAA believes this technology, not currently allowed by U.S. standards, is the first real solution to providing more light for drivers at night and AAA supports changes in federal law to allow ADB to be used to its full capability. The number of crashes in the United States in different lighting conditions in 2016 was more than seven million with nearly two million of those occurring in darkness, according to the National Highway Transportation Safety Administration (NHTSA). Of those night-time crashes, more than 18,000 fatalities occurred. Local motorists drive dark “rural” roads in many areas of Southern California such as roads in the Antelope Valley, Calabasas, Santa Clarita Valley and the San Gabriel Valley up by the foothills in Arcadia, Pasadena, Sierra Madre and Azusa. Other rural-like roads local drivers use include Mulholland Drive and roads in the Santa Monica mountain-area. In Orange County, several canyons have rural road conditions, including Silverado, Modjeska, and Laguna Canyon Road, where high-beams are needed. “Other areas with rural-like roadways are Chino Hills and going east toward Riverside, San Bernardino and then further out in the deserts of Palm Springs, Palm Desert and La Quinta,” said McKernan. “There are also many unincorporated locations in the San Diego-area with rural settings and darkened roads at night,” she added. 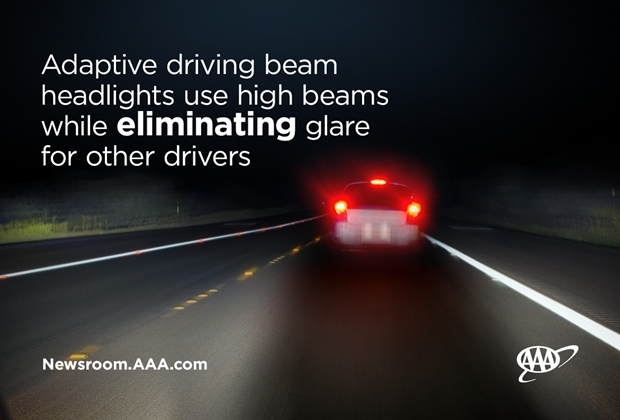 Previous AAA research found that 64 percent of Americans do not regularly use their high beams. High beams, however, improve forward illumination by 28 percent in comparison and are much more effective at providing needed light when traveling at higher speeds. With ADB, high beams are always on and when another vehicle is detected, that area is shaded to prevent glare that would otherwise interfere with the other driver’s field of vision. Another shortcoming in the U.S. standards, is how headlights are assessed for regulatory compliance. Currently, just the headlamp assembly is evaluated as a stand-alone part. This is done by static testing in a lab, which does not capture critical aspects of on-road illumination and performance, especially when evaluating a dynamic technology like ADB. The performance of these systems is dependent on the presence and location of other vehicles, as well as the camera/sensor, software and mechanism used to control the beam pattern. Monitor and adjust driving speeds when traveling on unlit roads at night to allow enough time to detect, react and stop the vehicle to avoid striking a pedestrian, animal or object in the roadway.